After six months of gains, the Small-Business Optimism Index fell by almost 2 points in March, settling at 92.5. After a promising start to the year, nine of ten index components dropped last month, most notably hiring plans and expected real sales growth each taking a significant dive, in spite of owners reporting the largest increase in new jobs per firm in a year. The March survey results ended what appeared to be steady, albeit slow, trend of improvement for the small-business sector of the economy. The percent of owners reporting inflation as their No. 1 business problem is now at nine percent, an increase from six percent in January. Reports of increases in average selling prices are rising and net 21 percent of the owners plan to raise their selling prices in the coming months. *Note: These components are measured as actual percentages of all respondents and are not net percentages. A net percentage is the percent positive minus percent negative. • Job Creation: Job creation in March was the bright spot in this month’s Index; the net change in employment per firm seasonally adjusted was 0.22, far above January’s “0” reading. Seasonally adjusted, 10 percent of the owners added an average of 3.1 workers per firm over the past few months, and 13 percent reduced employment an average of 2.1 workers per firm. The remaining 77 percent of owners made no net change in employment. Forty-four (44) percent of owners hired or tried to hire in the last three months and 32 percent reported few or no qualified applicants for positions. The ability to find qualified applicants for available jobs continues to be a problem for many small-business owners. The percent of owners reporting hard to fill job openings fell 2 points to 15 percent, the second monthly decline since reaching 18 percent in January. The net percent of owners planning to create new jobs is in its fourth month of decline. March’s net “0” reading for planned job creation was 4 points lower than February and 7 points lower than November 2011. The reports of actual hiring over the past few months are the best since February 2011, making March the best job creation month in a year. However, the decline in the percent of owners with a hard-to-fill opening and in the percent of owners planning to increase the number of workers employed indicate growing weakness in the job market and portend a rising unemployment rate. • Sales and Earnings: Owners reporting higher nominal sales over the past three months (seasonally adjusted) gained a surprising 8 points, rising to a net 1 percent, and providing the best reading since December 2007. However, even with the improvements in retail sales in recent months, 22 percent of owners surveyed still reported “weak sales” as their top business problem. Seasonally unadjusted, 23 percent of all owners reported higher sales (last three months compared to prior three months, up 3 points), while 31 percent reported lower sales (down 1 point). 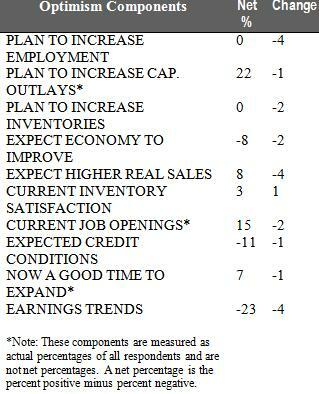 Expectations for higher real sales dropped, falling 4 points to a net 8 percent of all owners (seasonally adjusted). Not seasonally adjusted, 42 percent expect improvement over the next 3 months (up 1 point) and 16 percent expect declines (down 5 points). A lack of sales remains a problem for owners with 22 percent reporting “poor sales” as their top business problem. • Capital Expenditures: The frequency of reported capital outlays over the past six months fell 5 points to 52 percent, a reversal of the gains made during the two months prior. Of those making expenditures, 36 percent reported spending on new equipment (down 4 points), 20 percent acquired vehicles (down 3 points), and 13 percent improved or expanded facilities (unchanged). Four percent acquired new buildings or land for expansion (down 1 point) and 11 percent spent money for new fixtures and furniture (down 1 point). Plans to make capital outlays in the next three to six months fell one point, with 22 percent of owners indicating they are likely to make the investment. Seven percent of owners characterized the current period as a good time to expand facilities (seasonally adjusted), and the net percent of owners expecting better business conditions in six months settled at a negative 8 percent. Not seasonally adjusted, 21 percent expect deterioration (up 4 points), and 23 percent expect improvement (up 2 points). A net 8 percent of all owners expect improved real sales volumes, down 4 points from February. • Credit Access: Financing continues to be low on the list of concerns for small-business owners. Only four percent cited financing as their top business problem, compared to 20 percent citing taxes and 19 percent citing unreasonable regulation. Ninety-two (92) percent reported that all their credit needs were met or that they were not interested in borrowing. Twenty-seven (27) percent reported all credit needs met, compared to eight percent who reported that not all of their credit needs were satisfied. Just over half of owners said they did not want a loan, and 13 percent did not respond to the question. Thirty-one (31) percent of all owners reported borrowing on a regular basis. A net 11 percent reported loans are “harder to get” compared to their last attempt (asked of regular borrowers only), also down 3 points. The net percent of owners expecting credit conditions to ease in the coming months was a seasonally adjusted negative 11 percent (more owners expect that it will be “harder” to arrange financing than easier), 1 point worse than February. Today’s report is based on the responses of 757 randomly sampled small businesses in NFIB’s membership, surveyed throughout the month of March. Download the complete study at http://www.nfib.com/sbetindex.